1. A 5-cm incision was made in the upper midline and omentectomy is initiated through this small incision using a mini-retractor (Kent Retractor TKZ-F10328-D5; Takasago Medical Industry Co Ltd., Tokyo, Japan). A 12-mm trochar was inserted below the navel for a laparoscope. 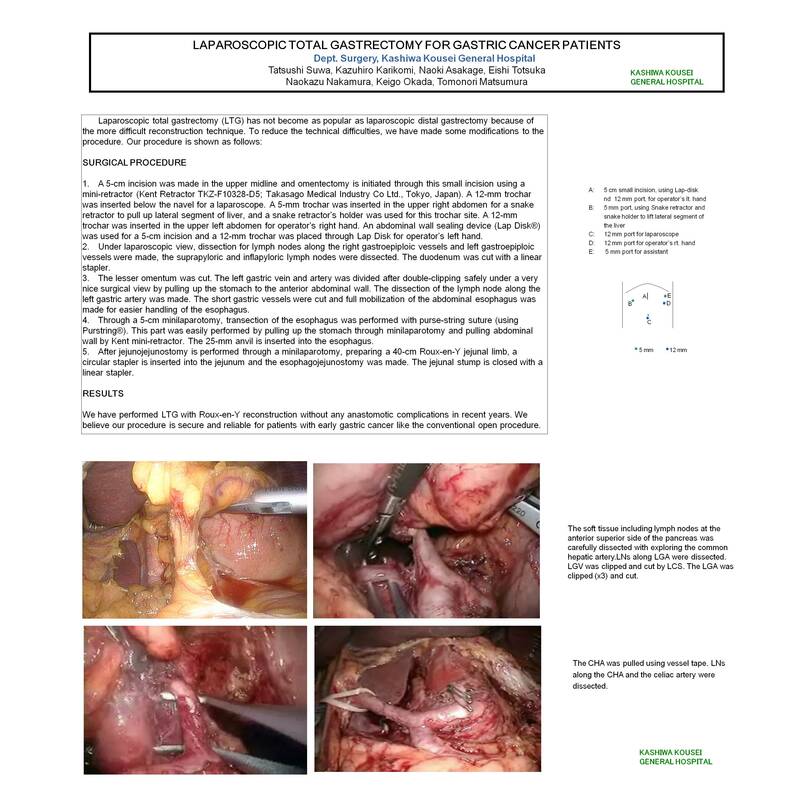 A 5-mm trochar was inserted in the upper right abdomen for a snake retractor to pull up lateral segment of liver, and a snake retractor’s holder was used for this trochar site. A 12-mm trochar was inserted in the upper left abdomen for operator’s right hand. An abdominal wall sealing device (Lap Disk®) was used for a 5-cm incision and a 12-mm trochar was placed through Lap Disk for operator’s left hand. 2. Under laparoscopic view, dissection for lymph nodes along the right gastroepiploic vessels and left gastroepiploic vessels were made, the suprapyloric and inflapyloric lymph nodes were dissected. The duodenum was cut with a linear stapler. 3. The lesser omentum was cut. The left gastric vein and artery was divided after double-clipping safely under a very nice surgical view by pulling up the stomach to the anterior abdominal wall. The dissection of the lymph node along the left gastric artery was made. The short gastric vessels were cut and full mobilization of the abdominal esophagus was made for easier handling of the esophagus. 4. Through a 5-cm minilaparotomy, transection of the esophagus was performed with purse-string suture (using Purstring®). This part was easily performed by pulling up the stomach through minilaparotomy and pulling abdominal wall by Kent mini-retractor. The 25-mm anvil is inserted into the esophagus. 5. After jejunojejunostomy is performed through a minilaparotomy, preparing a 40-cm Roux-en-Y jejunal limb, a circular stapler is inserted into the jejunum and the esophagojejunostomy was made. The jejunal stump is closed with a linear stapler. We have performed LTG with Roux-en-Y reconstruction without any anastomotic complications in recent years. We believe our procedure is secure and reliable for patients with early gastric cancer like the conventional open procedure.